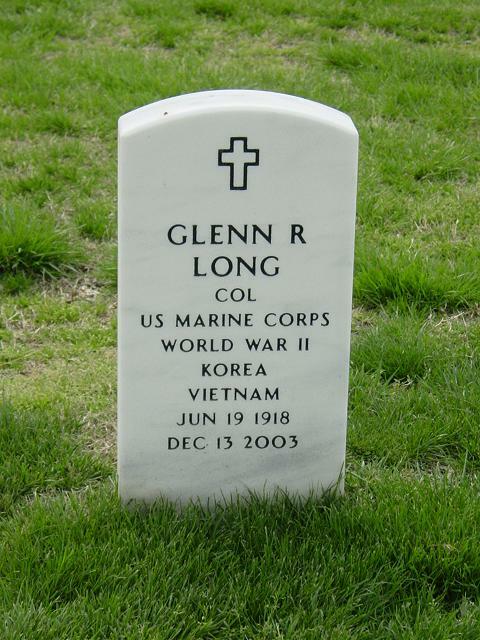 Colonel Glenn R. Long, United States Marine Corps (retired) died Saturday, December 13, 2003, at New Hanover Regional Medical Center following an extended illness. He is survived by his daughter, Elizabeth Lynne Franz; son-in-law, Captain Rodney C. Franz; grandson, Lieutenant George F. Franz and wife, Carol; grandchildren, Jared, Tristan, Zoie, Caleigh, and Jordan. A visitation will be held from 7 to 8 p.m. on Wednesday at Andrews Mortuary, Market Street Chapel. Services will be held at 10 a.m. at St. James Parish, 25 South Third Street, by the Reverend Steve Teague. Interment will be in Arlington National Cemetery at 10 a.m. on Tuesday, December 30, 2003. Born June 19, 1918, in Upper Glade, West Virginia, and raised in Arlington, Kansas, Glenn was the son of the late Alban W. and Olive Given Long. At Kansas State University, Glenn played three varsity sports while earning a BS degree in electrical engineering. After graduating with honors from the Reserve Officer Training Corps at the University, he was appointed a Marine Second Lieutenant on July 1, 1939. During a 26 year military career, Glenn held every command from a platoon to a regiment. He was a decorated veteran of both World War II in the Pacific and the Korean conflict earning the Legion of Merit with Combat "V" and two Bronze Star Medals with Combat "V" devices. As a senior officer, he served at the highest military planning levels including tours at Headquarters USMC, the Joint Staff, and the Office of the Secretary of Defense. After military retirement, Glenn earned a scholarship to Duke University and completed an MS in mathematics in 1966. He then joined the math department at UNCW where he taught for 17 years, a time of explosive growth for the unviersity. Glenn was dedicated to the service of country and community. He was a role model for excellence in two professions and for his extended family. He took great pleasure in his family, and the many friendships formed during his Marine Corps career as well as those made in Wilmington, North Carolina. Memorial may be made to St. James Parish, 25 South Third Street, Wilmington, North Carolina 28410. Lower Cape Fear Hospice Care Center, 1406 Physicians Dr., North Carolina 28401 or to a charity of one's choice.